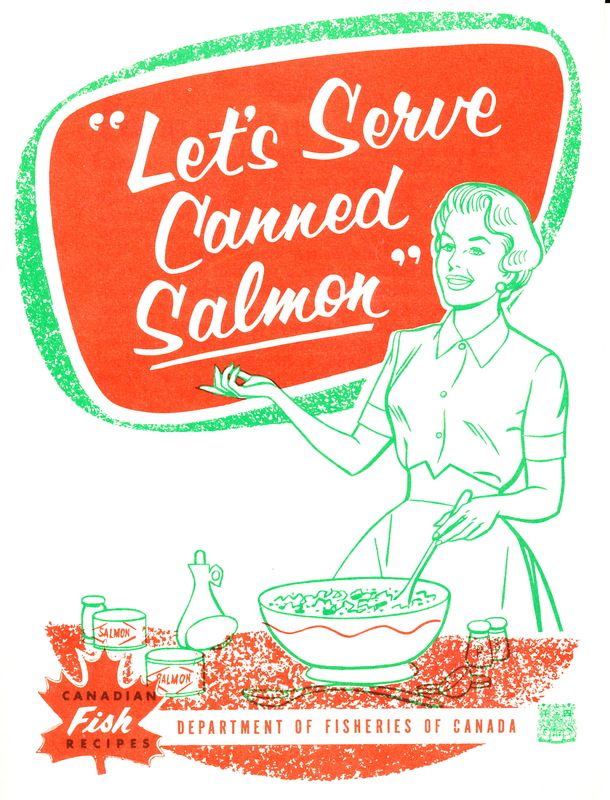 “Let’s Serve Canned Salmon” was a recipe booklet promoting BC canned salmon developed by the Home Economics Section, Department of Fisheries, Ottawa. In addition to the booklet, there was a filmstrip that could be borrowed by home economics teachers and women’s organizations “free of charge.” The booklet reflects the time when the Canadian Government promoted consumption of certain foods through “Consumer Service” branches located across Canada. Many of these employed home economists. What makes this booklet interesting in today’s context is that it was a project of the Federal Government that promoted a BC product! 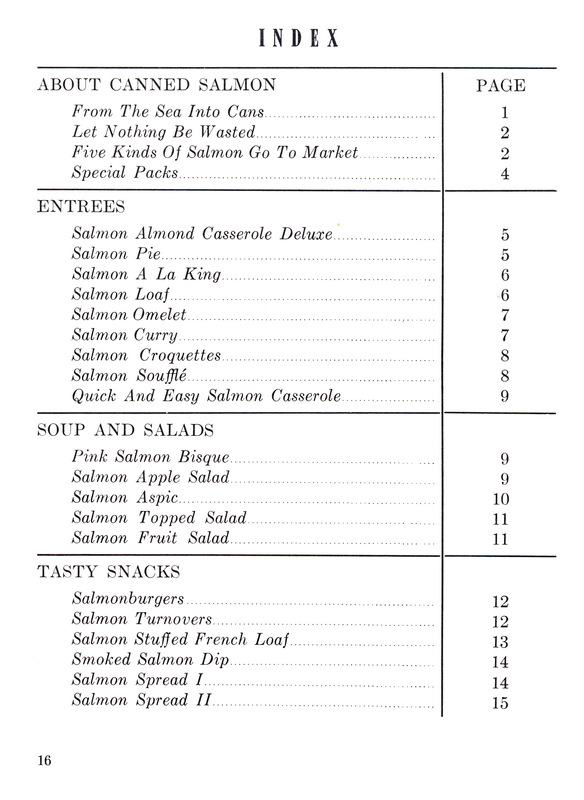 The booklet was published in 1959 and consists of 16 pages that promote canned salmon as “a wholesome natural product.” It explained the canning process, the nutritional value, and the characteristics of five kinds of salmon on the market: sockeye, coho, pink, chum or keta, and spring. The index lists all the recipes included with some of the more trendy 1950s ones being Salmon Almond Casserole Deluxe, Salmon Pie, and Salmon Souffle. A can of condensed soup was a common ingredient in many of the recipes. I searched though some old Canadian Home Economics Journals I had from the 1960s to see who might have developed the recipes or authored this booklet. “News from Canada’s Capital” was a regular feature in the Journal issues of 1963-64. The news indicated that home economists were employed in the RCAF Food Services Branch; the Department of Health and Welfare, Nutrition Division; The Department of Agriculture, Consumer Section; and Department of Fisheries, Consumer Branch and they were located in offices across Canada. It was indeed a different time! I wonder if anyone still uses this recipe booklet today. Or, were you one of those home economists employed by the Federal Government? It would be great to know more about this era that appears to belong to the past. My mother must have this – I will check! Canned salmon was a staple in our home. Mom will say that as a baby I survived on canned salmon and canned tomatoes! Our picnics always consisted of a can of salmon, a fresh loaf of bread and some vegetables – then we would purchase milk at a store near our picnic location. To this day I love salmon and yes, our picnics often copy my childhood experiences. Thank you for letting me think about this wonderful food in a different way! Canned salmon is still a staple in my home. If you have canned salmon, you can easily make a quick lunch or dinner. Great idea as a picnic food!